Now, this is not the kind of thing Keller was arguing, but it’s what many people heard, and struggle to reconcile. There are underlying principles that are true, even if they might break down. 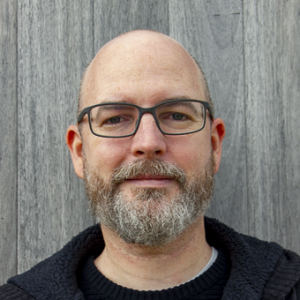 In this article, I want to focus instead on something else in Keller’s statements that I see as seriously wrong, from a biblical and conditionalist standpoint. 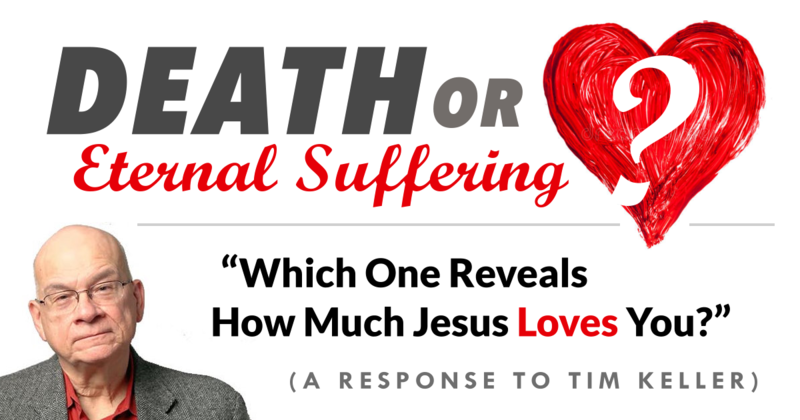 Here’s the issue: the Bible presents Jesus’ death in our place as the precise measure of God’s love, not his eternal torment (or some softened form of this). Whenever Keller isn’t trying to explain hell, he would no doubt affirm the centrality of Jesus’ death. But his claim that Christ’s demonstration of love is only comprehended through the lens of eternal suffering ends up taking the focus off Christ’s death in our place. Not only that, it grossly misunderstands the significance of his sacrificial death, and victorious return to life. This is an important litmus test for any doctrine of hell: is it squarely in phase with the basic tenets of the gospel? Does it highlight and emphasize them, perhaps even help to shed further light on them? Or does it tend to shift focus away? After controversy erupted in the comments under his first tweet on the subject of hell, Keller felt the need to clarify with another: “God takes our misery and suffering so seriously that He was willing to take it on Himself.” This was meant to explain how suffering, even eternal suffering, reveals how much Jesus loves us: God takes it seriously enough to take it upon himself. Obviously, that would be a seriously loving thing to do! Pastor Keller is a good apologist, and would realize that hell is widely understood to be God’s arrangement, yielding this legitimate concern: How can a loving God arrange something so ostensibly non-loving as eternal suffering? This is not simply an objection from soft-hearted postmoderns; it’s a charge of logical incoherence. A common response is to say that God takes sin very seriously, but here Keller is saying that God takes human suffering very seriously, so did something very loving to save us from it. It’s a creative attempt to map hell to the cross—but it doesn’t seem to really address the concern. After all, hell is for the unsaved, so evidently God hasn’t taken their misery and suffering seriously enough to ensure that they don’t suffer it eternally, even if He has made it possible to avoid. But this article is about Keller’s theology, not his apologetics, so we must press on. I would simply add that when apologists inadvertently defend poor theology, it often ends up backfiring. Correct theology is important for its own sake, but it also drives better apologetics. Whatever Happened to Jesus’ Death? Perhaps if the apostle John were alive today, he would have responded to Keller’s second tweet thus: “By this we know love, that he laid down his life for us, and we ought to lay down our lives for the brothers.” (1 John 3:16). This truth follows very closely from Jesus’ teaching, “Greater love has no one than this, that someone lay down his life for his friends” (John 15:13). A person’s life is the ultimate sacrifice—just think of Isaac during Abraham’s supreme test—because our lives are our most precious possession. Therefore, there is no greater love than to willingly die for the sake of others. This is true in general, and it’s true in the case of Jesus. As these verses show, once we know and understand that Jesus laid down his life for us—and how this exemplifies his love–we can see how it obligates us to do the same if necessary. There’s no puzzle here, in need of some missing piece. Keller is trying to say that Jesus’ sacrifice is profoundly loving because it saves us from eternal suffering, and therefore we just can’t understand (“will never know”) his sacrifice apart from that kind of hell. As I’ll show, however, Keller unfortunately ends up saying that while still alive Jesus suffered hell for us. He is missing the whole point: Christ’s death, in our place. Maybe the apostle John would have tweeted again: “For God so loved the world, that he gave his only Son, that whoever believes in him should not perish but have eternal life” (John 3:16). The original Greek here conveys that God’s precise act demonstrates the measure of his love for us. In other words, it’s not saying how intensely God loved us (“soooooo much!”), but rather, in what specific way. A glance at the previous verse reminds us that the act was Jesus being “lifted up,” which points to his crucifixion. In that way, God gave his only Son to the world in love. If you were there when Jesus said these words, you would have understood without need of a separate key to unlock meaning. Echoing this teaching, the apostle Paul observes that “God demonstrates his own love for us in this: While we were still sinners, Christ died for us . . . while we were enemies we were reconciled to God by the death of his Son” (Rom 5:8, 10). Now that is truly magnanimous! So Jesus Christ died for us, the most profound thing ever done, and the most profound thing we could ever say. We cannot exclude the fact that this was a painful death (that’s a nuance for another time), but a death it most certainly was. Yes, Jesus “loved me and gave himself up for me” (Gal 2:20). He “loved us and gave himself up for us, a fragrant offering and sacrifice to God” (Eph 5:2). What does it mean to lovingly and voluntarily give himself up for us, if not to give up his own life? This is perfectly coherent and understandable as a sacrifice for others, without us having to invoke eternal suffering. To do so is to entirely miss the point, and to distort the focus. When someone dies for someone else, the natural inference to make is that the other person might then go on living (at least, to hopefully live out their days without having to die prematurely). The saying, “I’d take a bullet for you” comes to mind. In fact as I’ve argued elsewhere this is essentially what John 3:16 is saying, only stipulated in everlasting terms. The conditionalist position is that believers in Christ will be resurrected immortal, and like him “will never die again” (Rom 6:9). We are rescued from death, not from endless suffering. Let’s ponder this for a moment. What it’s clearly not saying, is that the first person of the Trinity loves the second person of the Trinity only because of the latter’s obedience unto death. What it is saying, is that in his humanity, Jesus was deserving of the Father’s love due to his great sacrifice. That sacrifice is shown here to be death, the laying down of his life. But something else is detailed for us in this formula-like statement. Jesus doesn’t die so that he can get in to some disembodied hell or underworld. Instead he dies so that he might return to life in resurrection. That’s why he laid down his life for us—so he could be resurrected for us, a Savior who “for their sake died and was raised” (2 Cor 5:15). And it is how his love and righteousness turns into a rescue from death, both for him and for us in future. This makes perfect sense once we realize that what Jesus was doing for us was defeating death itself, and conquering the grave. Afterwards he says in triumph, “I died, and behold I am alive forevermore” (Rev 1:18). As the author of Hebrews explains, “Since therefore the children share in flesh and blood, he himself likewise partook of the same things, that through death he might destroy the one who has the power of death, that is, the devil, and deliver all those who through fear of death were subject to lifelong slavery” (Heb 2:14, 15). Death comes for us all, and will be “the last enemy to be destroyed” (1 Cor 15:26). But it has already relinquished its claim on Jesus, and for that we can be supremely grateful to him who “abolished death and brought life and immortality to light through the gospel” (2 Tim 1:10). The gospel is the message about Jesus’ death and resurrection, which this verse suggests transforms death into everlasting life for believers. This loving program of salvation from the Father through the Son is simply not about conquering the eternal sufferings of hell by having Christ suffer them too, somehow, instead of us. Emphatically, it’s about Jesus conquering death through dying sinlessly and rising forever. Resurrection is how the Father responds to the sacrificial death of his Son, transforming his death into victory, all according to an overarching redemption plan. The success of that plan means for believers that our own death-and-resurrection will be transformed, into a unique “death like his” and “resurrection like his” (Rom 6:5). Since the Father accepted the Son’s offering, his death was temporary and his resurrection permanent. For the finally unsaved on judgment day, resurrection will be temporary, and their deaths permanent. This is summed up by speaking thus of conditional immortality: the saved will be raised immortal, while the unsaved will be raised still mortal. Matthew 10:28—About Love Instead of Fear? Noting the ongoing confusion expressed in response to his tweets, Keller tried to address it one last time: “Seems like there is a lot of misunderstanding about hell out there. Hell is not about fear it is about love.” With this he included a link to his 2009 article, “The Importance of Hell.” We have previously responded to this article, so if you’re interested, you can read our two-part review here. To those who read tweets but not articles, Keller is just doubling down, determined to really sell the creative twist on what hell’s all “about.” It used to be about judgment and condemnation, for which love is not exactly the first thing to come to mind. Depending on whom you ask about hell, you’re likely to hear a mix of themes such as pain, suffering, punishment, misery, torment, fire, darkness, and so on. Fear seems like an appropriate response to those kinds of things, making Keller’s statement that it’s not about fear rather jarring. Perhaps he is forgetting Jesus’ clear teaching for us to fear hell: “And do not fear those who kill the body but cannot kill the soul. Rather fear him who can destroy both soul and body in hell” (Matt 10:28). with the spiritual destruction of hell, of losing the presence of God. Keller has Jesus saying quite a lot more in this verse than the verse actually contains! This is not a conservative hermeneutic at all. In point of fact, Jesus does deliberately compare the two occasions of destruction, which Keller suggests can’t be done. When we keep this comparison intact, we see that the second event incorporates the first, in order to implicate “both soul and body” in destruction. But since Keller contrasts this with “physical destruction,” calling it only “spiritual” destruction, it’s as if he doesn’t account for the parallel inclusion of the physical body in both events. The involvement of the body at Gehenna means that it is not a disembodied place, so occurs after resurrection, not before. But Keller writes, “Since souls are in hell right now, without bodies, how could the fire be literal, physical fire?” Wait—souls are supposed to be in hell right now, before the final judgment when Jesus will separate the sheep from the goats? This popular but incoherent idea is yet another manifestation of eternal suffering’s distorting effects. Were it the case, the setting for the Lazarus and the Rich Man parable would involve hell, not Hades. Hades corresponds to the Greek Sheol, the abode of the dead, or simply, the grave. It does not correspond to Gehenna, or for that matter the lake of fire in Revelation, where those cast in are first resurrected. As for Keller having Jesus casting Gehenna in Matthew 10:28 in terms of “losing the presence of God,” he’s blatantly reading that into the text, importing the idea from a mistaken reading of 2 Thessalonians 1:9. Jesus is teaching that God actively causes body-soul destruction in a way comparable to the body being killed by humans, not simply by relocating body-souls far away from himself. To be sure, he had been talking about all kinds of persecution, but in verse 28 he’s talking specifically about being put to death, as he also was in verse 21. In his article Keller rightly understands the imagery of Gehenna and worms (maggots) in relation to bodily “decomposition . . . into its constituent parts, to stink and to disintegrate,” but claims that a “totaled” human soul would never be destroyed in the same way, seemingly ignoring the fact that the term “destruction” is applied to both body and soul together. Do we even get to do that? Do we get to have God’s eternal fire operate in one way on a person’s body at Gehenna, then when that half of the process is complete, switch to a radically different operation? That’s what Keller’s view would require, once the body is included as it must be. Is that really what Jesus is saying? That such exquisitely painful torments as being sawn in half and burned alive are nowhere near as terrible as the torments of hell? This is just one more sign that Keller is shifting Jesus’ meaning away from death itself and placing it on suffering, a common exegetical misstep driven by a commitment to eternal suffering. Abandonment Theology—Jesus Mystically Suffered Hell on the Cross? When he cried out that his God had forsaken him he was experiencing hell itself. . . . We learn that what he felt on the cross was far worse and deeper than all of our deserved hells put together. And this makes emotional sense when we consider the relationship he lost. . . . The longer, deeper, and more intimate the relationship, the more tortuous is any separation. But the Son’s relationship with the Father was beginningless and infinitely greater than the most intimate and passionate human relationship. When Jesus was cut off from God he went into the deepest pit and most powerful furnace, beyond all imagining. He experienced the full wrath of the Father. And he did it voluntarily, for us. But compare this to Jesus’ own explanation: “I lay down My life in order to take it up again. No one takes it from Me, but I lay it down of My own accord” (John 10:17-18). This is what he did voluntarily for us, and the thing of real significance. When Paul summarizes the important elements of the gospel in 1 Corinthians 15:3-8, he makes no mention of suffering or emotional content at all, but instead cites Christ’s prophesied death for sin, his burial and resurrection, and his post-resurrection appearances. Implicit in this is a conditionalist understanding of death as the final consequence of sin for those without Christ, whereas the concept of eternal suffering simply does not emerge. In Keller’s treatment of atonement, Jesus experienced what no human ever could. But under penal substitution, the punishment Christ bore in our place is precisely what some humans will also undergo in the end. For Keller to be painting this as something far removed from human experience only serves to confuse. How will those sent to hell experience the unbearable relational loss Jesus experienced, if they’ve only ever been in God’s presence fleetingly, on Judgment Day? They have no love for the Father, like the Son and Father have for each other. But in our treatment of the same issue, the parsimony of penal substitution is clearly demonstrated, since straightforwardly the ending of life happened to Jesus, and will happen to the unsaved in the very end. Unfortunately, like many who hold to a hell of eternal torment/suffering, Pastor Keller has developed a theology of the cross where Jesus has a mystical, subjective experience of the Father abandoning him. Some even call this a spiritual death, as if to completely sideline his actual death in our place. This abandonment theology is based on a contextless and mistaken reading of Jesus’ cry, “Eli, Eli, lema sabachthani?”—“My God, my God, why have you forsaken me?” Ironically, it ends up inverting what is really going on. All who see me mock me; they make mouths at me; they wag their heads; ‘He trusts in the LORD; let him deliver him; let him rescue him, for he delights in him!’ . . . I am poured out like water, and all my bones are out of joint; my heart is like wax; it is melted within my breast; my strength is dried up like a potsherd, and my tongue sticks to my jaws; you lay me in the dust of death. For dogs encompass me; a company of evildoers encircles me; they have pierced my hands and feet—I can count all my bones—they stare and gloat over me; they divide my garments among them, and for my clothing they cast lots. He could hardly have recited the whole psalm in his predicament. He didn’t need to, in order to invoke it and apply it to his situation. It was common practice at the time to refer to a psalm by an early and memorable line—there were no chapters and verses by which to cite passages. In this context, the cry, “My God, my God, why have you forsaken me?” is rhetorical. Its purpose is to establish tension that is going to be quickly resolved, and transcended by the end. The psalm continues, “Why are you so far from saving me, from the words of my groaning?” The interpretive axis here is time. Jesus had been silent for hours before he cried out in this way. Seemingly, if we’re going by appearances, all hope is lost. Why does God delay his rescue? (see vv 1-2). Immediately, though, the psalmist is invigorated: “In you our fathers trusted; they trusted, and you delivered them. To you they cried and were rescued; in you they trusted and were not put to shame.” (see vv 3-5). Verse eight is noteworthy: “‘He trusts in the LORD; let him deliver him; let him rescue him, for he delights in him!’” (Psa 22:8 cf. Matt 27:43). On and on the tension builds, until the psalmist calls for God to not be far off, but to come quickly to his aid, and save “my precious life” (see vv 19-21). He continues on in praise until the end, declaring, “For he has not despised or abhorred the affliction of the afflicted, and he has not hidden his face from him, but has heard, when he cried to him.” (Psa 22:24). Did the Father turn away from Jesus, because Jesus became sin in some mystical sense and the Father cannot look upon sin? This is how some have tried to explain their abandonment theology, based on stringing together a handful of prooftexts (like Hab 1:13). Well, not according to this prophecy. He does not actually hide his face, but hears the cry of the Messiah. He has not forsaken the afflicted after all, contrary to the very human worries expressed in the first verse. Quoting it, Jesus feels the full depths of those emotions, but he knows—he surely knows—that they arise in the psalm from mere appearances, not from the reality that will unfold. By the time Jesus calls out, “Father, into your hands I commit my spirit” he has been faithful to the end. He quotes Psalm 31:5, invoking and identifying himself with another messianic psalm. Its theme, as with Psalm 22, is that of determination to keep trusting in God despite the most extreme and dire circumstances. Together they show what it’s like to persist in praise and prayer, despite the temptation to consider oneself abandoned by God. Abandonment theology would have Jesus the Messiah be despairing and confused, thinking that God had indeed forsaken him in some deep, relational sense—totally without any clear biblical description or reference to it, by the way—and desperately wanting to know why. But Jesus actually never was forsaken by the Father, and through it all, he never faltered in his trust. He Prayed for the Cup of Death to Pass—And it Did! Those who overly mysticize and subjectivize what Jesus did in our place, driven by a doctrine of hell grounded in subjective experience, typically see something similar in what Jesus underwent in the Garden of Gethsemane. The basic idea is that his sufferings started there, leading in due course to the cross. That’s certainly true, but it doesn’t mean that atonement spans his entire passion. Some have seen the beginnings of atonement in the garden, when Jesus’ “sweat was like drops of blood falling to the ground” (Luke 22:44). While it’s medically possible for his “sweat” to have literally been blood, the text is really just drawing an analogy, emphasizing how fervently Jesus prayed. What Jesus was praying about—the “cup” that the Father was to give him—figuratively contains the atonement (at least as far as substitution is concerned). He prayed in ernest that it be taken away from him if possible, but only if it was the Father’s will. And it was the Father’s will to do so, as we’ll see. There is a lot of confusion on this point, in large part due to the distortive effects of belief in eternal suffering. Noting that Jesus did go to the cross, a lot of Christians wrongly conclude from this that the Father must have given a blanket answer of “No.” Upon closer inspection, however, this awkward conclusion is unbiblical. The clear allusion here to the Gethsemane account establishes that the cup Jesus was asking to be taken away was the cup of death, and that the Father did honor his reverent request (as opposed to merely hearing the words spoken). We should be suspicious of any theology to suggest otherwise. The idea that the Father completely ignored and denied the request of his faithful Son, and proceeded to pour out the cup of infinite/eternal suffering anyway, must be rejected as false. If we find that Hebrews 5:7 challenges our theology, we should respond by accepting it and seeking to better understand why it is so. The answer to that is found in the prayer itself. There were two ways for the cup to pass, and Jesus asked for either alternative, if in fact any would be possible according to the Father’s will. This submissiveness is described in Hebrews 5:7 as “reverence,” while the phrases “in the days of his flesh” and “with loud cries and tears” help us to focus on Jesus’ humanity, which carried the same vulnerabilities and limitations that we ourselves experience (Heb 4:15). For Jesus to do anything representing human beings like us, therefore, it was crucial that he remain utterly dependant upon the Father’s will, though he could easily have asked to be saved by “more than twelve legions of angels” (Matt 26:53). If you’re a wicked and evil person, asking God to bring you back is probably not a good idea. But Jesus had the Father’s favor. And he loved his disciples, whom he called his friends. He longed to come back from the dead. Once he did come back to life, he went to his friends, built a fire and cooked fish for them. Of this occasion, Augustine opined that “the fish roasted is Christ having suffered.” This takes the allegorical approach to an absurd degree—why must we spiritualize and over-interpret everything? Is it because we sense holes in our theology that might otherwise be exposed? Or are we so focused on his divinity that we cannot discern when the Bible is using the lens of his humanity? Life is a gift from God, and due to sin is normally temporary, ending in death. Undeserving of death, Jesus voluntarily laid down his life for us. He prayed to the Father that his death would pass. His prayer was answered, and he rose from the dead victorious over it. To have conquered death in this way, means rising from the grave forever. It is “through death”—the particular death of Jesus Christ—that we are able to be saved from death, just as Jesus himself was saved (Heb 2:14 cf. 5:7). It was not suffering alone, but “the suffering of death” through which Christ did “taste death for everyone” (Heb 2:9). Believers are saved from death following the same pattern, not by avoidance, but by rescue. As for what we might therefore say about final punishment, it’s this: those who die in their sins will be raised only temporarily, to face justice, issuing in a public determination that they are not among those worthy to receive the everlasting gift of life. Space does not permit proper treatment of how to understand the meaning of Jesus’ sufferings in relation to others. If we do want to investigate that, we should look to a text like 1 Corinthians 1:25, where Paul was “filling up what is lacking in Christ’s afflictions for the sake of his body, that is, the church.” Or 1 Peter 2:21, which says that “Christ also suffered for you, leaving you an example, so that you might follow in his steps.” Keller is right to seek pastoral application in this area. As for any connection of suffering to Christ’s atoning work on the cross, if we seek to include it, we should not do so in any way that risks de-emphasizing Jesus laying down his very life to atone for sins. He dies, bodily, so that the world might have life. Unlike those who ate manna and later died, whoever partakes of his sacrificial death will not die, but will live forever. In context, the phrases “not die” and “will live forever” are straightforward to understand, and do not yield to a spiritualized interpretation. Keller is at times so close to seeing with fully clarity the internal logic of Christ’s atoning death and resurrection, and how it relates to a “hell” that will end the lives of the unsaved forever (annihilation). He has tweeted, “God suffered to end evil without ending us”—which implies that God should end those who persist in evil. He has tweeted, “Suffering can refine us rather than destroy us because God himself walks with us in the fire”—which implies that those “in the fire” without God’s protection would be destroyed. But why not answer much more simply and directly? Jesus loved you so much that he willingly died for you—though this is what you deserve, not him—and in so doing made it possible for you be able to live forever. In other words, it cost him his very life. We can understand this love because we all know something else too, just as profound. We realize, deep within our souls, that our very lives are a gift from a loving Creator. The “author of life” was killed by men (Acts 3:15), but he rose from the grave to offer us “life and immortality . . . through the gospel” (2 Tim 1:10).